This picture of Knockout was taken several months ago, on the day we first worked on ground hitching. I love this picture because Knockout is so very obviously completely relaxed and at ease while obediently standing still for me. I first started ground hitching on a whim. At a local cattle drive we participated in last October, I was impressed by a horse who stood ground hitched while a host of people, horses and cattle circulated nearby. I thought that was a pretty cool trick that might come in handy, sometimes. A few days later, I was working with Knockout on quick response to light cues to advance and back on a lead line. We were paying special attention to being particular about number of steps. If I asked for one step forward I wanted one step and one step only. As we practiced this choreographed dance together, it occurred to me that between each move was a tiny rest. Between each step a tiny rest existed in which the horse awaited my next cue, ready to move either forward or back at my request…or to simply stand. The rest is, in fact, the natural default position…rest is the no pressure moment in which I am neither asking for an advance nor a retreat, but in which the horse stands attentively relaxed ready to do either. On a whim, I asked for a step back and as Knockout completed the step I dropped the rope and took a step back myself. Knockout shifted his weight forward in anticipation and I held my hand up in a pushing motion, “Whoa! Stay!” And Knockout complied. He simply stood at rest…the equestrian equivalent of a soldier standing at ease…relaxed and ready…restful and attentive. Ground hitching has now become a natural part of our daily interaction. When I bring Knockout up from pasture, he stands ground hitched as I groom him. I fly-spray, comb tail and mane, pick hooves, and brush his coat as Knockout stands quietly at ease, tethered in place by a lead line dropped on the ground. Then I step into the tack room and come back out carrying a saddle and saddle pad. Knockout continues to stand at ease as I throw the pad in place, settle the saddle into position, walk around him to make sure the various pieces are hanging properly, and cinch up the girths. I step out again, shaking a loop from a coiled rope. I swing the loop a few times and fling it over Knockout’s back, flick it a few times until it drops to the ground, then drag it around his hooves as I neatly recoil and strap it securely to the saddle horn…all while Knockout calmly stands tethered to the ground. Except he’s not really tethered is he? The end of the rope is not attached to anything. Knockout could walk away or run off anytime he chose to. It’s neither a trick nor a deception. I’m not fooling Knockout into thinking he’s securely tied when he’s not. He and I both know he can walk off anytime he wants. In fact, he occasionally will walk off. Just yesterday, I stepped out of the tack room with the saddle to glimpse Knockout stepping around the corner. For a moment I thought he was avoiding saddling. Then I realized my teenage son was tying his horse and Knockout stepped around the corner to greet his pasture mate. I simply walked over, picked up the lead line, walked Knockout back to his original position by the tack room door, dropped the lead line, and said “Whoa!” as I resumed saddling up. No big deal! No fuss, no bother…just a quiet correction…followed by business as usual. No, the ground hitch doesn’t fool anybody. Knockout knows the rope is not secured to anything. He knows he can walk off anytime he wants. So why doesn’t he? Why doesn’t he simply ignore the ground hitch and wander at will, wherever he pleases? Why does he stand patiently at ease as I walk around him, grooming and saddling? If the rope doesn’t hold him in place, what does? Knockout stands still, not because he is unable to move, but because he understands I want him to stand. He trusts my guidance and respects my leadership. So he stands…calmly relaxed…at ease…relaxed and ready…restfully attentive. 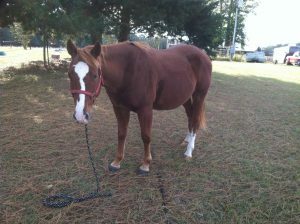 Knockout is tethered in place, not by the rope, but rather by his confidence in me. I have come to really like ground hitching. To me, ground hitching has come to symbolize much of what I strive for in my pursuit of horsemanship. Rather than making Knockout stand, I’m asking him to stand. He complies with my request out of his confidence in me rather than being forced to. I show Knockout respect by asking rather than forcing. Knockout shows me respect by voluntarily complying with my request. We are both more relaxed…both trusting each other. Knockout isn’t bothered by unnecessary restraints and I’m not worried about him breaking any restraints. While ground hitched, Knockout and I are both abiding in the rest…that default position of being relaxed and attentive between cues. And that’s where I want us to be. While riding, I want to carry that rest with us. Between cues, I want Knockout to be relaxed and attentive…at ease and responsive. While traveling straight at a trot, I want Knockout to hold that sense of rest as he continues trotting in a straight line…not trying to second guess the next move…not worried about what’s going on around us…not tensely anticipating what comes next…just calmly relaxed…confident he will feel my next cue and will know how to respond when asked. Yes, Lord! Bind my wandering heart to you. Teach me to rest in you…to confidently relax trusting your goodness…at ease and responsive…relaxed and attentive…not worried about the future…just attentively abiding as I await your next prompt. This entry was posted in Faith, free will, God's Position toward Us, Horses and tagged abide, abiding, at ease, attentive, ground hitch, ground hitched, ready, relaxed, rest, resting by joe. Bookmark the permalink.